Edmonton's Poet Laureate program is supported jointly by the City of Edmonton, the Edmonton Public Library and the Edmonton Arts Council. The creation of this position confirms the city's support for the arts in general, and for the literary arts in particular. Historically, a Poet Laureate served as the official chronicler of state events and occasions. In ancient times, the Laureate was the central means for recording and communicating history. "Laureate" comes from the Latin word ‘laureatus', meaning adorned with a crown of laurel, an honour also bestowed on the earliest Olympic athletes. More currently, the role of a Poet Laureate is to reflect the life of a city through readings of poetry. As an ambassador for the literary arts, the Laureate incorporates poetry into a range of official and informal city activities. Award-winning poet Ahmed ‘Knowmadic’ Aliopens a new window is a full-time writer, actor, comedian, public speaker and youth worker who inspires with his dynamic, thought-provoking and humorous poetry. Ali experienced intense culture shock when his family escaped the civil war in Somalia. First moving to Italy then to Canada, Ali quickly learned what it meant to be different. During his youth, Ali struggled to value his culture and religion while managing confrontations with fellow students and authority. He turned to family and the arts to gain a new outlook on life. Soon after Ali discovered a love for the spoken word he became a co-founder of the Breath in Poetry Collective. 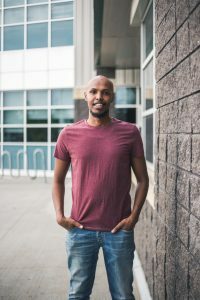 He has since become the first Somali champion at the Canadian Festival of Spoken Word; facilitated poetry workshops in a Wales correctional facility; represented Canada on the International Literary stage; and received the Northlands Emerging Artist Award in 2015. More than an accomplished poet, Ali uses his talents to inspire and uplift the local community. Ali encourages Edmonton’s aspiring poets and youth to use poetry as a positive form of self-expression and exploration of identity. A poet and community builder, Ali brings a contagious positivity and inclusivity to everything he does. Ali, who was announced as Edmonton's seventh Poet Laureate on June 27, 2017opens a new window, will serve a two-year term, July 1, 2017 to June 30, 2019. Keep informed about Ali’s events by following him on Twitteropens a new window and Facebookopens a new window. His website also has upcoming appearances,opens a new window blog updatesopens a new window and poetryopens a new window. Read Ali's latest blog via the Edmonton Arts Council, which is a Q&A reflection on his first year as Edmonton's Poet Laureateopens a new window.